Melbourne contributor Kate @kateflatman took her little ones to a disco last weekend but not any ordinary disco - a Jurassic Dinosaur Disco! 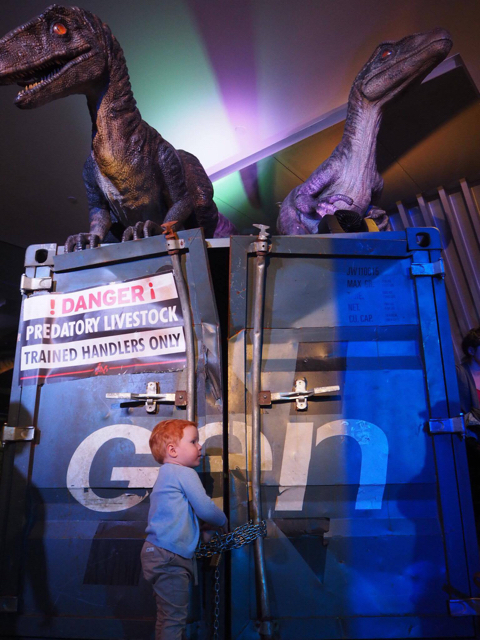 The Melbourne Museum has been running a Dino disco over the last two Saturdays where little ones and their parents have boogied on the dance floor and checked out the Jurassic World: The Exhibition. The disco's last session is on this Saturday 20th of August so be quick to book your tickets (details below)! Thank you Kate for the review and pics! It's Saturday night and I am heading to a disco with my two year old twins. For many this would seem to be a very strange situation but following the latest craze that has seen the hottest trending nightclubs across the world transformed into child-proof discos for toddlers, pre-schoolers and parents, Melbourne Museum has launched its own unique experience for families with Jurassic Dinosaur Disco. I mean, who wouldn't be excited?!? Arriving at Melbourne Museum we instantly hear disco greats playing as we are decked out with glow sticks by the Jurassic Dinosaur Disco crew and ushered down the escalators into the dance hall. The dance floor is already filled with little dinosaurs who are energetically dancing to the tunes courtesy of the guest DJ. Coloured LED and UV lighting set the space for a real party atmosphere and I even spotted a disco ball hanging above the centre of the dance floor. Many of the little disco goers have come dressed in their favourite dinosaur costume, much to the amusement of Arlo who enjoyed chasing several dinosaur tails around the dance floor! Disco DJ Dino Dave is on the dance floor ready to teach the crowd some new dinosaur disco moves. Dressed in a green spiked dinosaur hat, black leather jacket, red bell-bottoms and sparkly silver shoes, Dave certainly stood out amongst the crowd. While Macy stayed on the dance floor with Grandma to learn some new moves, Arlo joined Grandpa and I to visit the residents of Jurassic World: The Exhibition. I wasn’t too sure how Arlo would go in the exhibition (seeing that he is only 21 months old) but he was absolutely fine. There were a few moments that he got a little bit scared and wanted to give me a cuddle but he quickly turned back to wave and say hello to the lifelike dinosaurs. I think I was more scared having a rare up-close look at the most vicious dinosaur of them all, Tyrannosaurus Rex! Ahhh! Jurassic World: The Exhibition is well worth visiting if you have a budding palaeontologist or dinosaur lover and it's definitely a bonus to experience it after dark included with your Jurassic Dinosaur Disco admission ticket. After hitting the dance floor for one last boogie, (including our best John Travolta impersonation from Saturday Night Fever!) we shuffled our two tired little dinosaurs back up the escalators, giving Disco DJ Dino Dave several high fives on the way out. Jurassic Dinosaur Disco is a fantastic night out for the whole family and we cannot recommend it highly enough. Book tickets online to make sure you don’t miss out. The last disco is this Saturday 20th August. The exhibition sessions must be booked between 6-7pm, with the last entry at 7pm. Parking underneath Melbourne Museum is $7 flat rate with entry after 4pm. There is a café/kiosk open adjacent to the exhibition, serving light snacks and beverages until 8pm. If your little one isn’t interested in dressing up, the museum and exhibition gift shops have a fantastic selection of dinosaur toys and merchandise for sale. Miss Macy loved bopping along with her blue and purple dinosaur plush toy by her side. For more info and to book tickets, head to the Melbourne Museum's dedicated website.